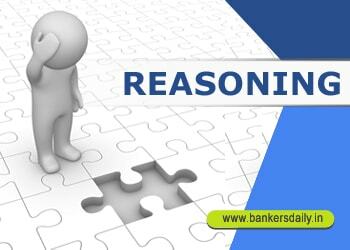 The Puzzle section was the definite question in the reasoning ability section in the IBPS CLERK PRELIMS Exam 2017 and you can check the review and analysis of the IBPS CLERK Prelims Exam 2017. It changed for various slots and the number of questions asked also varied. So we can expect the same in the forthcoming batches too, here were are providing some questions to solve to entice your preparations for the IBPS CLERK PRELIMS EXAM 2017. You can get surely 5 marks or more questions which could boost your score to a different level. ii. J doesn’t live in a lowermost floor. Who lives on topmost floor? 2. How many person(s) live between S and the person who lives on seventh floor? 3. If we arrange the persons in an alphabetical order from top to bottom then who occupies on floor number four? 4. H is related to P in a same way S is related to A then how is A related to which of the following person in a same way? 5. If P and S , J and B interchange their position with each other then who lives immediately above and immediately below Q respectively? 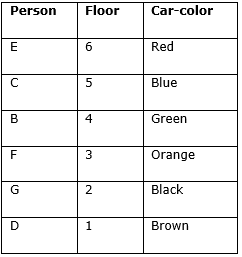 B, C, D, E, F and G are six friends living on different floors in the same building having six floors numbered one to six.The ground floor is numbered one, the floor above it is numbered two and so on.All of them have Cars of different Colours via– Brown, Black, Orange, Green, Blue and Red but not necessarily in the same order. 8. Which colour Cars is between blue car and black car? 9. On which of the following floor does C live? 10.Which of the following statement is true with respect to D? You can check the answers for the puzzle questions from the one given below. So if you got all the questions correct, you are in great form and keep going with the preparations for the IBPS CLERK PRELIMINARY EXAMINATION 2017 and also for the RBI ASSISTANT MAINS EXAMINATION 2017.